You can connect to any Amazon Marketplace region with Order Desk to import your Amazon and Amazon Handmade orders. Tracking information will be sent back to Amazon as orders are fulfilled. 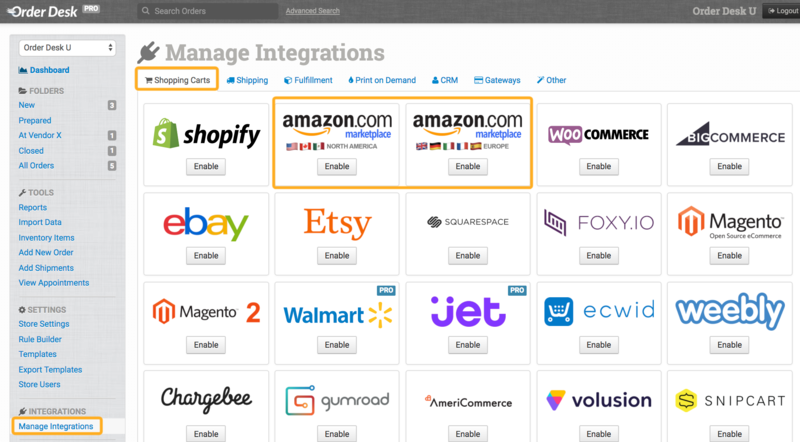 This guide will go over the settings and features for the Amazon Marketplace integrations. If you are looking for information about the Fulfillment by Amazon (FBA) integrations, please see this guide instead. All six regions are available and can be found under the Shopping Carts tab: Amazon North America, Amazon Europe, Amazon Australia, Amazon Japan, Amazon China and Amazon India. 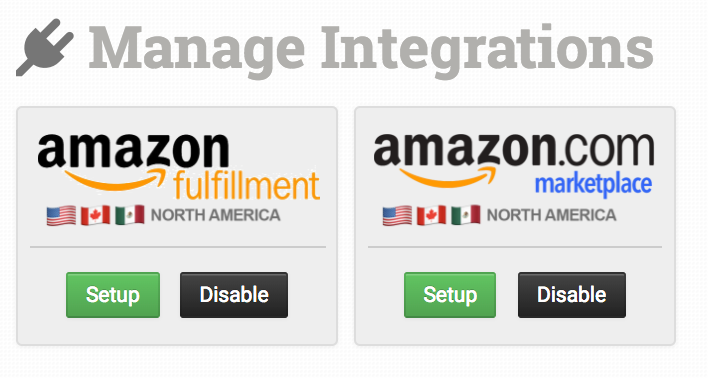 If you have separate Amazon logins for Canada and the US, connect to one with Amazon Marketplace NA and the other with our legacy Amazon Marketplace integration. If you need the legacy integration enabled on your account, contact Order Desk support. Complete the connection between Order Desk and your Amazon Marketplace account(s) by following the prompts in the integration. To connect to Amazon Marketplace, you will see the developer name and ID to take into your Amazon account. You will also need to enter your Seller ID and MWS Auth Token into Order Desk to complete the connection. 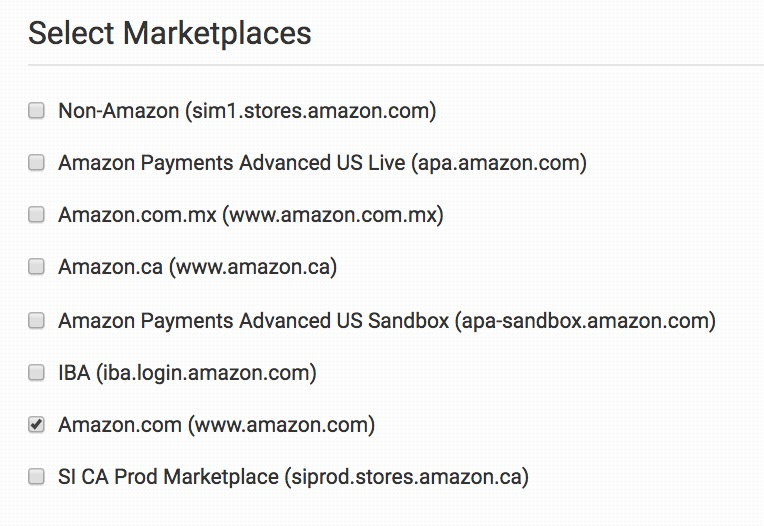 Most merchants will select Amazon.com for North America, but if you also have country specific marketplaces or are connecting to a region other than North America, be sure to include the appropriate marketplaces for your account. Select how often to download orders from Amazon. Options include: Never, Every Day, Every Twelve Hours, Every Six Hours, Every Two Hours and Every Hour. Choose the folder where you would like newly downloaded orders from Amazon to be placed. If you would like to use your own custom folders, see this guide for instructions on how to create them. If enabled, when shipments are added to orders, Order Desk will send the fulfillment details back to Amazon to fulfill the orders and notify your customers. 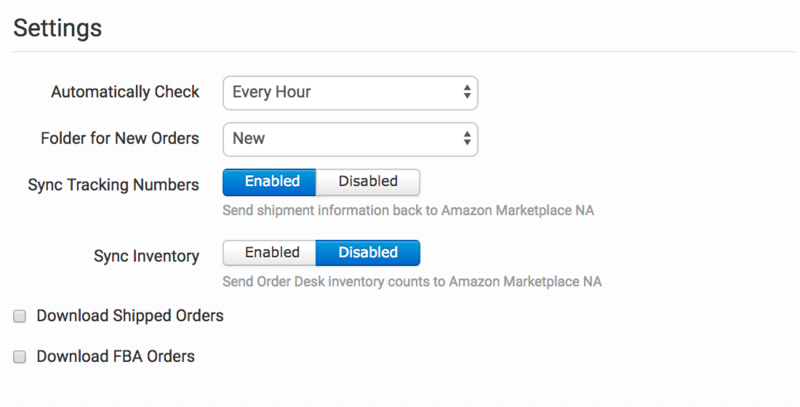 Enable the Sync Inventory option to send inventory counts to Amazon Marketplace. This will report the inventory that is available in Order Desk to Amazon. Any SKUs which Amazon does not recognize will be ignored. For more information on how inventory syncing works, read this guide. If you have orders in Amazon that have already shipped but you want to download them to Order Desk for your records, select the Download Shipped Orders option. If you send Amazon Fulfilled Orders (AFN) to FBA directly from Amazon but you still want to download these orders to Order Desk, select the Download FBA Orders option. If you would also like to have the tracking numbers reported to Order Desk as Amazon fulfills these orders, you will need to have the corresponding FBA integration enabled in Order Desk. 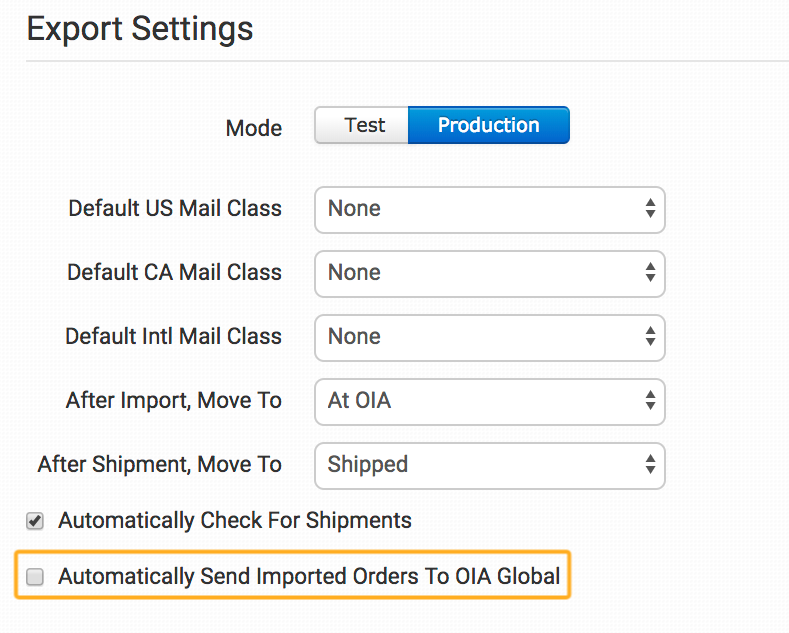 If you download shipped or FBA orders, make sure you do not have any fulfillment service integration setting enabled that automatically submits all orders and that any rules you have are set up to filter out these orders. Continue reading for instructions on how you can filter these orders out of the way. If disabled, orders can only be sent manually or automatically with a rule, allowing you to filter out the orders that should not be sent for fulfillment. You can use the Order Desk Rule Builder to set aside any AFN orders so they aren't sent for fulfillment as they're downloaded into Order Desk. As an example, you can set up a rule to move all AFN orders to the Closed folder. Once this rule is in place, make sure any other rules submitting orders for fulfillment are not pulling orders from the Closed folder, or from whichever folder you chose for these AFN orders. Given the customizable nature of the rule builder, there are many different ways possible to set up rules to prevent these orders from being sent for fulfillment. If you need help with this, please contact Order Desk support. 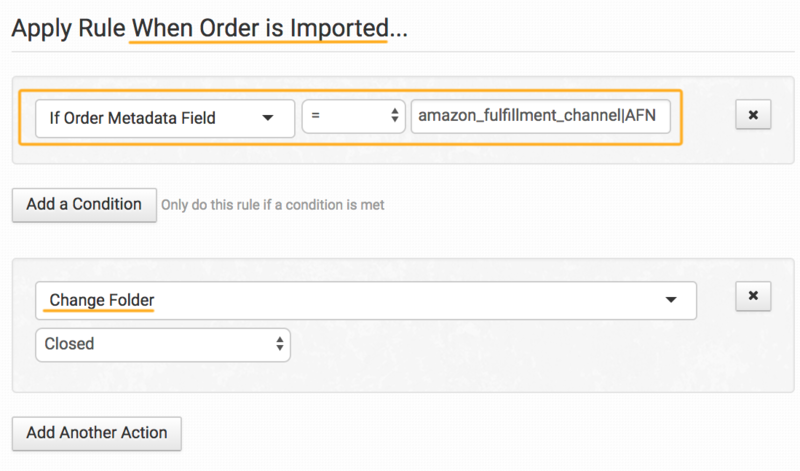 If you would like to import older Amazon orders, or if you have your integration set to never download new orders, you can manually import orders by entering the date in the Import Orders field and clicking Check. This will bring in all orders that fit your saved settings, if they haven't already been downloaded to Order Desk, from that date forward. You may need to run the check a few times if you have a large number of orders. The date will gradually move forward until it reaches the present and all orders have been found and imported. You can click through to see the results of each feed submission, which can be helpful for debugging. This information can also be retrieved from the MWS Scratchpad. 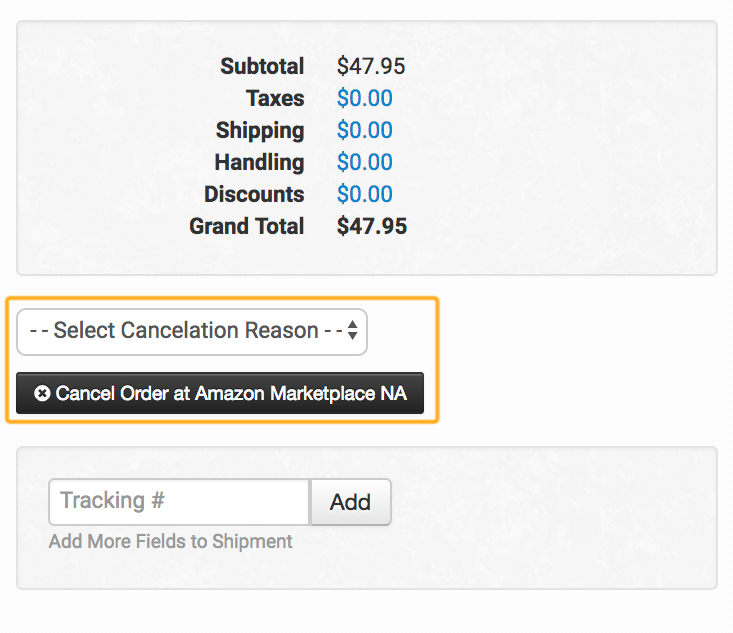 Then click the Cancel Order at Amazon Marketplace button. This will start a submission process of the acknowledgement feed to Amazon. After this button is pressed, there will be a five minute delay in case any other orders are also canceled. After five minutes have passed, the feed will be submitted to Amazon and the order(s) canceled. With Amazon Marketplace, you can send updates to Amazon on the items in your orders if these details are stored as item metadata on your inventory items here in Order Desk. Set either AFN or MFN. Number of days for handling time. For information about storing item metadata, please see the How to Work with Inventory Details guide. If you are enabling multiple Amazon Marketplace integrations for separate regions, you may need to set up some rules and/or custom folders, depending on where these orders are being sent. Every Order Desk store has a completely unique setup, based on the store requirements, but we'll provide some general guidance here to get you started. If, after reading through these guides, you aren't certain about or comfortable with setting up your store, please contact Order Desk support and we will be happy to assist you. Before contacting us, it helps to already have all of your integrations enabled. Also please provide as much detail as you can about how your orders will be fulfilled so we can help you create the rules you need. If your orders will be sent to multiple fulfillment services, this will require a little more set up depending on where they are going and how you determine which orders go to your separate vendors and fulfillment services. Perhaps you'll need to set up rules by shipping country to send to separate fulfillment services. If that is the case, you can follow the instructions in our Submitting Orders to Amazon FBA Worldwide guide to see how those rules will look. While that guide is specific to sending orders to FBA, you can see the rule structure needed and apply it to any other integration. 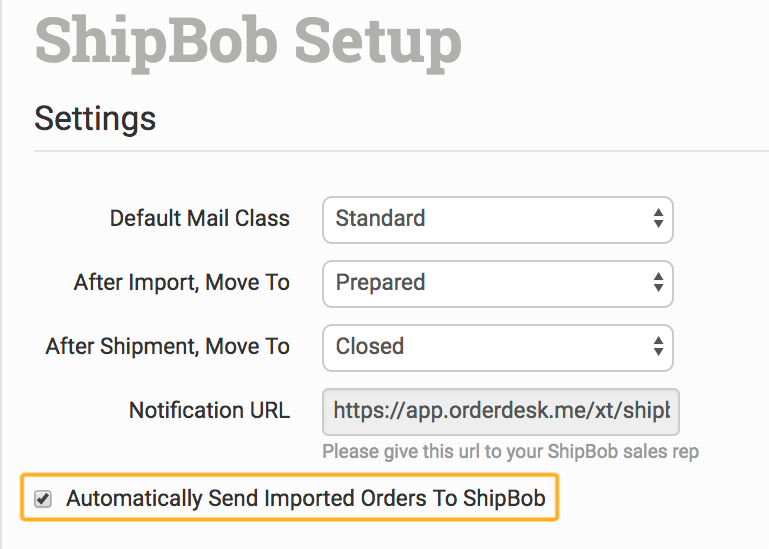 Additionally, some fulfillment and shipping integrations have a setting that lets them pull orders from a specific folder. Double check your integration settings to see if this is the case and, if so, you can set up a rule to move orders to that folder and let the integration take over from there. If you still need help with setup, please enable all of your integrations and contact Order Desk support. Please provide as much detail as possible about where your orders are coming from and how you decide where they are going. With these details, we can help you get your store running automatically. Do you support Amazon Handmade? Yes. Amazon Handmade orders will be imported by the regular Amazon Marketplace integration for the region you sell in. If you are working with Print on Demand products, please refer to our Print on Demand Fulfillment guide for a thorough overview of how to use Order Desk with your print on demand store. Will VAT taxes be included in orders from Amazon Marketplace? Yes, for any orders coming in from Amazon Marketplace EU, the VAT tax will not be added on as an extra tax but will instead be included in the price. The VAT amount will also be set as a metadata field called vat_tax on the order. If you are sending these orders to Shopify for fulfillment, the VAT tax will be figured into the order total in Shopify, otherwise, you can use this metadata field if you need to include or display the VAT tax amount in any templates, exports or emails. How do I download my FBA orders? Despite how it sounds, you cannot download FBA orders with the FBA integration. Instead, enable the Amazon Marketplace integration to import orders already fulfilled by Amazon (AFN) by FBA. Any orders coming from Amazon will be imported through the Marketplace integration, which is an order source. Any orders going to Amazon for fulfillment will be submitted through the FBA integration, which is a fulfillment service. Please read this section of this guide for more details. My Amazon integration won't connect to Order Desk due to an error about MWS. How can I fix this? 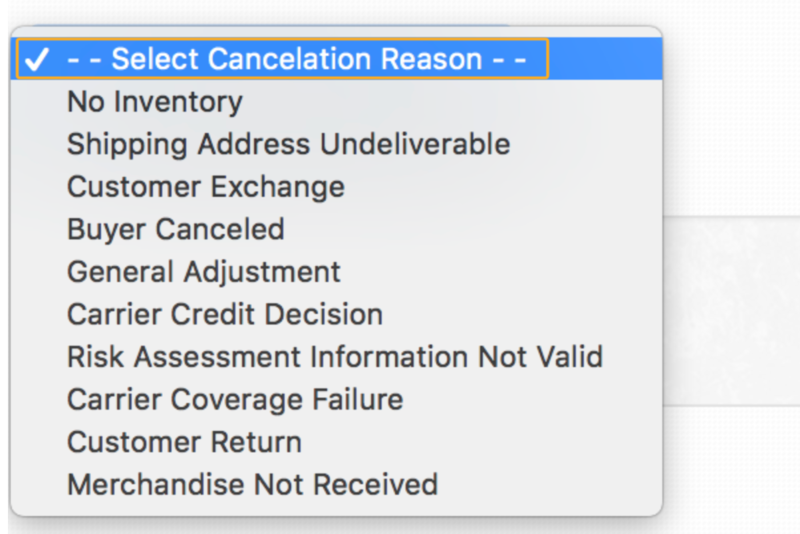 If you're unable to make the connection between Amazon and Order Desk, or you previously made the connection and are now getting the error: Connection to Amazon FBA failed: Connection Error: The seller does not have an eligible Amazon account to call Amazon MWS. For more information about eligible accounts, see the Amazon MWS documentation, this means that Amazon prevented or disabled your connection due to your MWS eligibility. Please read their documentation on MWS and be certain that your Amazon account is in good standing and using the right plan for access to MWS.